At the moment, I am sitting on a deck in West Virginia watching and listening to a thunderstorm roll in and thankful that it waited until after our morning hike. I love a good thunderstorm, especially when they are so conveniently timed. Since our hiking is on hold, I thought it would be a great time to pull out my morning-time memories from July. I know some people are not very keen on spiders, but they don’t bother me if I know they aren’t poisonous and they don’t get in my way. We even had a beautiful argiope build a nest on the porch at our old home and we liked her so much we named her “Miss Nelly.” When the powerwasher came to clean the house, he thought I was crazy when I gave him strict instructions not to dare harm Miss Nelly! Back to July….and a web I saw the morning sunlight shining through-they can be a real work of art. The home-wrecking wrens abandoned the nest they ousted the black-capped chickadees from…apparently the male wren may build several nests before the pair choose the nest to use. Below, mama wren is waiting for me to leave the porch so she can take the moth in her mouth to her waiting babies. She took over my hanging Fuschia plant, and I don’t know how long I was watering the poor eggs before I saw the wren and discovered the nest. All is well, I didn’t drown the fledglings, and I will post pictures of them soon. A mourning dove looking rather coy, or regal, not sure which…. And finally, what would I do without my morning, or anytime, Harold sightings! He really showed me some new stuff this month. I was actually worried about him when I first observed this strange wing “arrangement.” I watched him for a while until to my great relief, he flew away, allaying my fears that he was somehow hurt. When I googled this spread-wing posture, I learned that this can be done to dry their wings, keep their balance when perching, regulate body temperature and several other reasons. Next, if I hadn’t known herons build their nest up high, I would have thought he was building a nest on one of his favorite perches during another morning observation of him. I watched him for a while as he grabbed different sticks off the fallen log and put them down into a pile before he finally found one he liked and flew off with it! I don’t know if he was adding it to a nest already in the making or if it was the stick he planned to use to woo a passing female with. 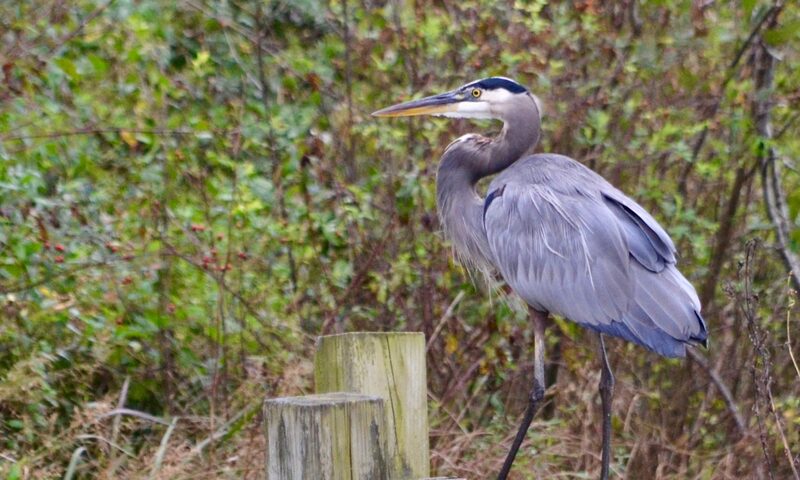 Since nesting season is pretty much over, however, and herons stick with the same mate all season, I’m really not sure what Harold was up to… maybe the nest just needed some repair. So, that wraps up my morning time from July in pictures! The rain stopped here in West Virginia, and my son and I were able to get in an after-dinner hike and take in some more scenery of this beautiful state. I look forward to sharing some of those pictures with you! Thank you, I think stargazer lilies are stunning! Previous PostPrevious Kayaking at Dusk… Carpe Diem!